Article tiré du blog businessesgrow.com. I have been writing and speaking on some new ideas about where I think social media and digital marketing will be going over the next few years. It seems pretty clear to me … let’s see if you agree. To explain my premise, allow me to provide a brief description of where we have BEEN, which will lead to where we are GOING. So far, we have seen three distinct phases or revolutions of digital marketing. These revolutions have not replaced each other but have built on the progress and moved us forward. Our first digital revolution occurred at the dawn of the web in the late 1990s. Our business priority was simply establishing a website. Once we had a site, it needed to be discovered. Enabled by Google, our business priority turned to search engine optimization (in fact a $26 billion industry was created!). 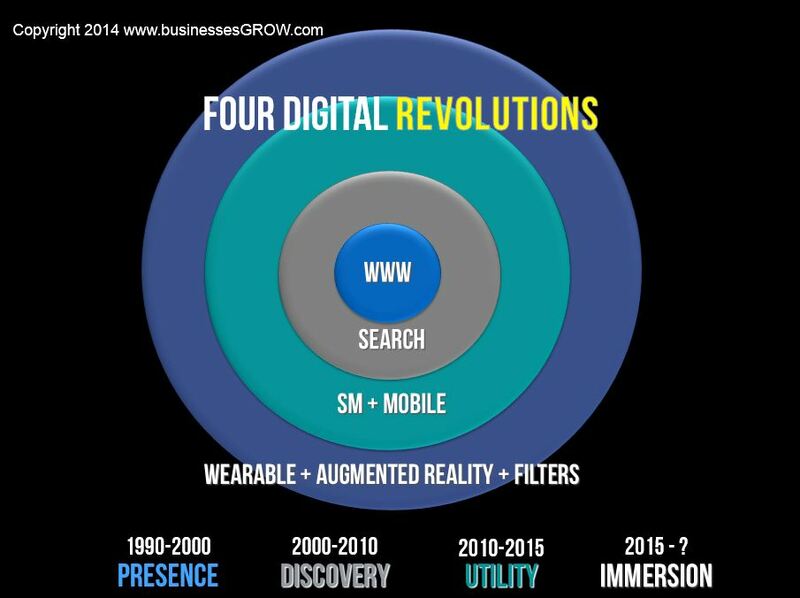 An emphasis on “Discovery” was the second digital revolution. Today, we are in the third digital revolution, which has been enabled by social media and mobile technology. Our business goal in this phase is to help and serve people at their point of need, whether they are looking for a movie review, the best price on a laptop, or product information at the point of sale at a retail store. By the way, at the edge of each of these revolutions, life becomes more difficult for marketers. If you were the first in your industry with a website, you had an advantage until your competitors caught on. Likewise, if you were the first to crack the code on SEO, Oh Happy Day! You led the search results as long as your competitors were sucking on ether. Today, the world is more difficult because competitors are also fueling their helpful presence with content. If they were first and dominant in their niche, good news, good news, good news. But if the niche is filled, they are probably in Content Shock. In the next 18-24 months we will be entering the fourth digital revolution. This will be an era of explosive marketing creativity and innovation enabled by wearable technology and augmented reality. The impact of this development will be profound … perhaps more profound than the Internet itself. The way we learn, discover, connect and entertain ourselves will be dramatically altered. Imagine a world where we are untethered from devices and the strength of a wi-fi connection. The Internet will surround us like the air that we breathe – a digital layer on top of the “real world” in any place we choose. Every book, every wall — even a package label — will come alive with interactive possibilities. This will be an era of marketing without boundaries and I think it will be fueled by a marketing emphasis on fun, immersive experiences. But there is virtually no limit to a person’s desire to have fun. In fact, we would rather play games and have fun more than anything (there is a lot of psychology behind this that I can’t get into in this short post). I think the winners in the next revolution will be creating fun, immersive experiences on a daily basis for their customers. Like every other marketing phase, early adopters will flourish and those late to the game will struggle. Maybe five years from now I will be writing about “Fun Shock” – we will be overwhelmed by competing opportunities to interact. “Minority Report” will seem quaint. What do you think of these implications? What are your thoughts on this next frontier, or perhaps more appropriately, the next FUNtier? This post was written as part of the IBM for Midsize Business program, which provides midsize businesses with the tools, expertise and solutions they need to become engines of a smarter planet. I’ve been compensated to contribute to this program, but the opinions expressed in this post are my own and don’t necessarily represent IBM’s positions, strategies or opinions. IBM had no editorial control of this content.